William Miller, founder of the Adventist movement, announced that Christ would come in 1843. When that prediction failed, a revision was made and 1844 was set. That prophecy also proved to be short of the mark. Joseph Smith of Mormon fame taught that Christ would come no later than 1891, but he missed it, too. C. T. Russell, founder of the Watchtower organization, declared that the Second Coming would occur in 1914. Again, failure! In recent years, Hal Lindsey, author of the popular book The Late Great Planet Earth, argued that the “signs” of Matthew 24 indicated that Jesus would return to earth by about 1988. Lindsey arrived at this conclusion by suggesting that the “generation” which witnessed the rebirth of Israel (1948) would also experience the Lord’s visible return. Since a generation is supposed to be about forty years, Lindsey surmised that Christ would return to effect the “rapture” (a notion without biblical support) by approximately 1988. Then there’s Harold Camping, who published a book titled 1994? in which he asserted that according to his calculations, Christ was due to return on September 6, 1994. He also mentioned that 2011 could be the end of the world. Later, Camping would revise his calculations to May 21, 2011, as the date for the Rapture and October 21, 2011, as the date for the end of the world. Another utter failure. The alleged proof for these recent calculated dates for Christ’s return is said to be found in the alleged signs of Matthew chapter twenty-four. 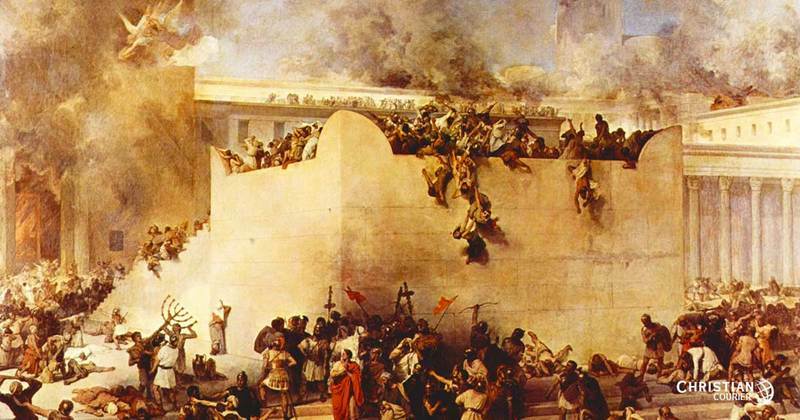 Obviously, the Savior spoke of that awesome destruction of Jerusalem, which would be accomplished some forty years later as the Romans demolished the holy city. As they sat on the mount of Olives, the disciples asked the Lord when “these things” would be, and what would be the “sign” of his coming and of the end of the world. They may have assumed that the destruction of the temple and the end of the world would occur at the same time. If such was the case, Christ sought to correct that misconception. The Olivet sermon is divided into two major sections. First, Jesus dealt with the impending destruction of Jerusalem and the “signs” that would herald that event (Mt. 24:4-34). Second, he spoke of his final return and the lack of signs that would characterize that occasion (Mt. 24:35ff). It is certainly a sad tragedy that hysterical speculators on Bible prophecy would take those signs that have to do solely with the destruction of ancient Jerusalem and attempt to give them a modern application in the context of a nuclear Armageddon! It is equally erroneous to allege that the entirety of Matthew 24 refers to the destruction of Jerusalem, as argued by the proponents of the Realized Eschatology doctrine. The signs which the Lord mentioned are found in Matthew 24:4-14. We will not take the time to discuss these in this article, but it is sufficient to say that every one of them was fulfilled within the forty-year span between the time of the Lord’s discourse and the destruction of Jerusalem in A.D. 70. Cecil May, “Matthew 24,” The Biblical Doctrine of Last Things, (David Lipe, Ed., 1984, pp. 115ff). The Signs of Matthew 24: Destruction of Jerusalem or Second Coming of Christ? In the balance of this discussion I simply want to conclusively show that the signs of Matthew 24:4-14 could not find their fulfillment in the final return of Christ. There are four strong arguments that prove the signs of Matthew 24:4ff relate to the destruction of Jerusalem in A.D. 70. “Verily I say unto you, this generation shall not pass away, till all these things be accomplished” (Mt. 24:34). The expression “all these things” refers to the signs the Lord had given. And “all these things” — the signs — were to be accomplished before “this generation” passed away. The question is — what is the meaning of “this generation”? Dispensationalists are fond of saying that “generation” has reference to “race,” hence, it is merely an allusion to the Jewish race. Accordingly, the Lord was indicating that these signs would be fulfilled while the Jewish race was being preserved (cf. The Scofield Reference Bible). Such a view of “generation,” however, is at variance with the use of that word in the New Testament. In their Greek Lexicon, Arndt and Gingrich comment that genea (“generation”) refers basically to “the sum total of those born at the same time, expanded to include all those living at a given time generation, contemporaries” (1967, 153). A survey of several passages in Matthew’s gospel will quickly confirm this (cf. Mt. 11:16; 12:39, 41, 42, 45; 16:4; 17:17; 23:36). Clearly then, the signs of the Olivet lesson were confined to the first century. Modern nuclear war or ancient local conflict? Second, Lindsey and others contend that the descriptions of Matthew 24 suggest an imminent international nuclear conflict. However, contextual considerations reveal that the Lord clearly had reference to an ancient and local situation. DESTRUCTION OF JERUSALEM: Christ plainly specified that the coming destruction would involve the ancient temple area [“the holy place” — 24:15], and the city of Jerusalem (cf. Lk. 21:20). FLEE TO THE MOUNTAINS: The disciples of Judea were warned to “flee unto the mountains” (16) — instructions that would hardly seem relevant in a time of atomic attack! However, according to the testimony of the historian Eusebius, Christians, prior to Jerusalem’s invasion, fled to Pella east of the Jordan River, and so were spared the fate of the Jews. DON’T GO DOWN TO GET THINGS FROM YOUR HOUSE: The Lord warned: “Let him that is on the housetop not go down to take out the things that are in his house” (Mt. 24:17). Again, such instruction would hardly seem appropriate if a modern nuclear assault were in view. But it made perfect sense in view of the fact that the houses of old Jerusalem were flat-roofed and adjacent to one another. Accordingly, Christians might proceed, via “the road of roofs,” to the edge of the city and escape (Edersheim, 93). PRAY FOR FAVORABLE WEATHER: The admonition, “Pray ye that your flight be not in the winter” (Mt. 24:20) anticipates primitive conditions when travel would be difficult. PRAY TO ESCAPE ON NON-SABBATH DAY: “Pray ye that your flight be … neither on the sabbath” takes into account the fact that the gates of the ancient city would be closed on the sabbath (cf. Neh. 13:18), a fact, of course, which did not obtain after the destruction of the city. Third, the illustrations introduced by Jesus to insure preparedness for his second coming preclude the possibility of signs being given to determine the time of that event. In a number of vivid historical illustrations, the Lord declared that no time indicators would be given to signal his return. Rather, the judgment day would catch men unawares. NOAH’S FLOOD: As the people of Noah’s day continued business as normal “until the day” the flood came, “so shall be the coming of the Son of man” (Mt. 24:38, 39). OVERTHROW OF SODOM: The people of ancient Sodom were oblivious to the disaster that befell them until “the day that Lot went out from Sodom,” even so “after the same manner shall it be in the day that the Son of man is revealed” (Lk. 17:28-30). LIKE A THIEF: Christ declared that he would come at an unexpected time, even as a thief does. “If the master of the house had known in what watch the thief was coming he would have watched, and would not have suffered his house to be broken through. Therefore be ye also ready; for in an hour that ye think not the Son of man cometh” (43, 44; cf. 1 Thes. 5:2; 2 Pet. 3:10). AN UNEXPECTED HOUR: The parable of the virgins in Matthew 25 surely teaches the lesson of constant preparation, for the bridegroom will come at the most unexpected time [the midnight hour — a most surprising time for a wedding!]. There is nothing in Matthew 24 that lends support to the theory that Christ gave signs that would herald the end of the world. Fourth, one of the most persuasive points demonstrating that the Lord gave no signs by which the end of time could be calculated is the affirmation of verse 36. The argument is devastating. Though Jesus gave the signs of Matthew 24:4-14, not even he knew when the time of his second coming would occur. It is therefore, obvious that the signs of Matthew 24 can in no way be employed to calculate the time of the Lord’s return! Does it not seem odd that modern “prophets” can read Matthew 24 and predict the day and hour of the end of the world, but not even he who spoke the message was able to draw that conclusion? That should say something to the discerning student! There are no signs concerning the end of the world. Let us strive, therefore, to be always prepared for the Lord’s return, or death, whichever should come first. Arndt, William & F. W. Gingrich. 1967. Greek-English Lexicon of the New Testament. Chicago: University of Chicago. Edersheim, Alfred. 1957. Sketches of Jewish Social Life. Grand Rapids: Eerdmans.